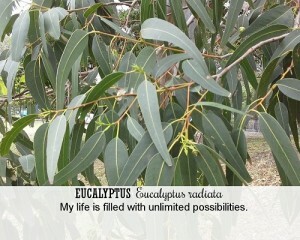 Eucalyptus is one of the oils I grew up with. 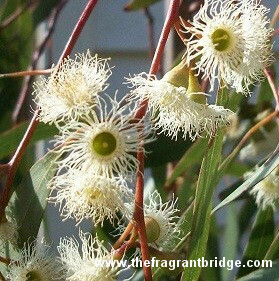 In times past whenever we had a cold or blocked nose we were given eucalyptus to smell usually on a tissue to help ease the symptoms. It is used in balms and cough lozenges and the trees are what give the Blue Mountains near Sydney their name. 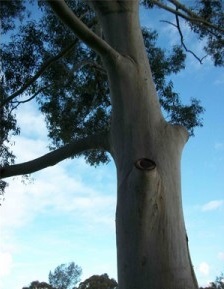 Synonyms: Tasmanian blue gum (E. globus), Eucalyptus australiana, Narrowed leaved peppermint gum (E. radiata). Aroma: Fresh, peppery-camphoraceous, medicinal. (E. radiata), camphoraceous with a woody sweet undertone (E. globus). Colour: Colourless to pale yellow. Plant: E. radiata is a small green evergreen tree growing to 15 metres. Trees growing to 30 metres have been found in old growth forests. E.globus can grow to 40 metres and has leathery pale blue green lanceolate leaves. The oldest bark peels off in long reddish patches, leaving a smooth, pale grey bark. Main Growing Areas: China, North and South America, Europe, India, Africa (E. globus), Australia (E. radiata). Major Constituents: 1.8 cineole, alpha-terpineol, limonene (E. radiata), 1.8 cineole, a-pinene, globulol. Interesting snippets: Although E. globus is produced in large quantities around the world it is not distilled in Australia. 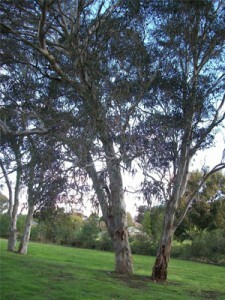 The eucalyptus is indigenous to Australia but has been planted in many other parts of the world from Australian seed. 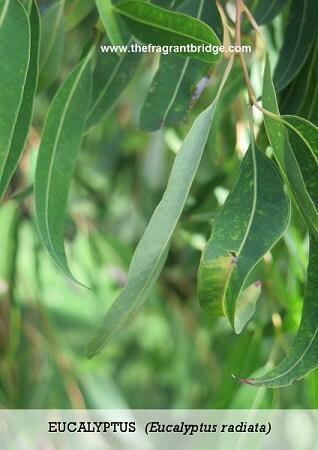 Indigenous Australians used eucalyptus leaves in decoctions and poultices for fever, respiratory problems and wound healing. 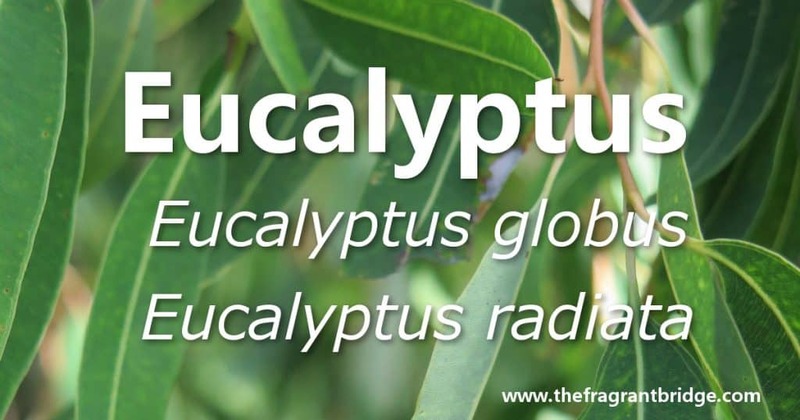 The name comes from the Greek word eucalyptos meaning well covered, because the flower buds are covered with a cup like membrane, which is thrown off as the flower expands. Eucalyptus essential oil was first distilled in Australia in 1788 and today produces 5 –10% of the 2000 – 3000 tons produced annually worldwide. Eucalyptus trees were planted in the most marshy and malarial areas of Algiers and due to the powerful drying action of the roots on the soil they turned those areas into some of the driest. Part of Plant used / Extraction: Leaves and twigs by steam distillation. Yields 3% from fresh material and 1.5% from dry. Therapeutic actions: Opens blocked nasal and respiratory passages so useful for colds, flu, bronchitis, sinusitis, laryngitis and tonsillitis. Muscle pain and arthritis. Increases concentration and logical thought. Emotional and Spiritual: Fresh and uplifting. Helps to dispel feelings of pessimism and listlessness. Helps to provide a positive outlook. Dispels stagnant feelings and negative energy allowing us to be open to other possibilities. 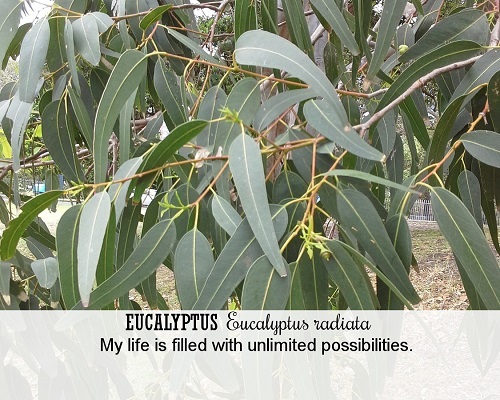 Valerie Ann Worwood writes that Eucalyptus radiata is a fragrance of newness, renewal and the seeking of new horizons while being fully aware of the past. 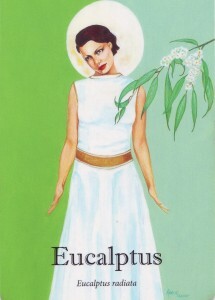 Eucalyptus awakens the power of our own healer within and is a precursor to the fragrances that exist on an angelic frequency. Its role is to encapsulate the spirit within the physical form. Gabriel Mojay writes that eucalyptus is suited to people who feel hemmed in by their surroundings. They sense the possibility of achieving greater freedom but dare not seek to create it due to excessive caution, fear or responsibility. Eucalyptus helps dispel the negative feelings and gives them inwardly room to breathe, leading to either change or greater acceptance thus transforming a sense of suffocation into one of expansive renewal. Robbi Zeck advises the use of Eucalyptus when you are overwhelmed with the many components in your life that require attention. She writes to get organised, create systems and plan ahead. Breathe in the stimulating aroma of Eucalyptus and imagine oxygen being received by every cell in your body expanding and integrating your thinking processes. 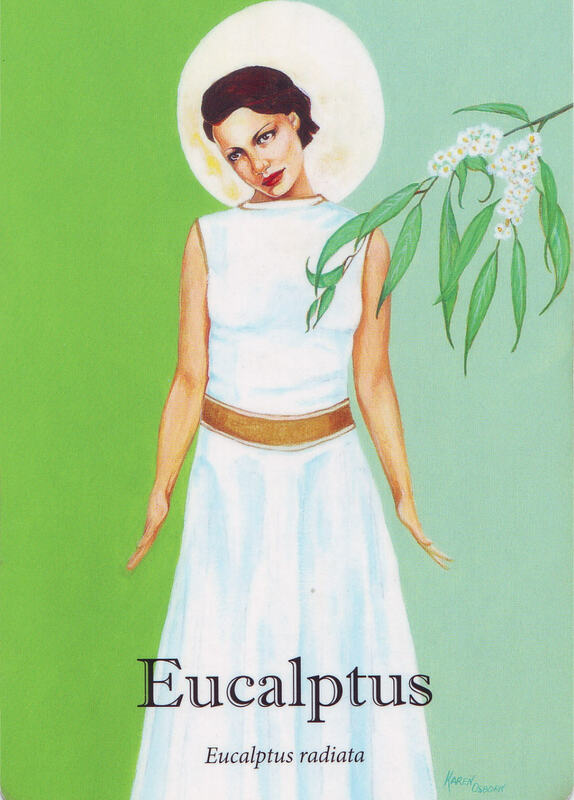 Patricia Davis writes to use Eucalyptus to cleanse any rooms or areas where there has been conflict both physical and verbal or where any negative energies are felt. Philippe Mailhebiau thinks Eucalyptus is one of the best essential oils that we can discover and one, which helps us to reveal the best of ourselves. Integration: Removes self-imposed restrictions, releases regrets and fears. Remove confusion and link all parts of the equation to make the whole you were seeking in the first place. Be spontaneous, give up negative habits and achieve the freedom you seek. Experience the lightness of Eucalyptus as you stop being predictable and integrate everything outside your box. Fragrant Change Healing Cards: My life is filled with unlimited possibilities. Are you feeling angry and frustrated because your needs are not being met? Are you feeling hemmed in by people, circumstances or your own inability to change? When things don’t work out the way you want, do you blame and try to manipulate others rather than accept you may be fully or partly to blame and look at ways you can change the situation? Release all your regrets about not having the life you wanted, face your fears and move towards the freedom you want. If you cannot change than either accept the way things are or compromise. Take responsibility for your decision and stop blaming others for the life you are living. Safety: Safe when used externally. Inhalation is not recommended for babies under 12 months old or for people who are prone to asthma. There have been serious side effects noted when the pure oil was taken internally. 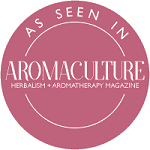 This entry was posted in Essential Oils and tagged colds, essential oil for respiratory passages, eucalyptus oil, flu, sinusitus on July 16, 2015 by Carole Hodges.